3D Dinosaurs screen saver with sound includes animated Tyrannosaurus Rex, Stegosaurus, Brachiosaurus and Pteranodon. Download for free one of the best dinosaur screen savers for Windows 7/8/Vista/XP. Age of Dinosaurs 3D Screen Saver offers you to make a free virtual tour of 3D dinosaur world and go back to the real prehistoric age with lifelike, roaring, moving, prehistoric creatures without leaving the comfort of your home. The virtual screen saver features the most famous Jurassic dinosaurs like Stegosaurus, Brachiosaurus, Tyrannosaurus Rex, Diplodocus and free flying Pteranodon. Download and try for free dinosaur screen saver with animated dinosaurs and 3D backgrounds for Windows. 3D dinosaurs screen saver features the exciting animated backgrounds of the world of jurassic dinosaurs, you will feel like you are moving over lakes, past tropical vegetation, and right up to the virtual prehistoric animals. All the objects, including the animated dinosaurs themselves are not pictures of dinosaurs, but three-dimensional models. The camera pans and tilts around the prehistoric landscape (complete with fog and rippling water) that provides a real animated realism to you and your family. Sounding authentic audio effects are not limited in helping you enjoy with the perfect and clear sounds of the prehistoric world. Select a particular time of day for this 3D dinosaur world or leave it on the auto setting and when the 3D screen saver runs on computer screen, you will see as the day turn into night. The digital clock and calendar helps you to know a current date or time. 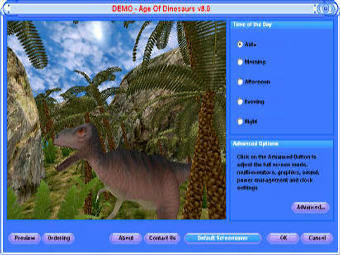 Free dinosaurs updates are available for minor versions of Age of Dinosaurs 3D Screen Saver. When you buy, full version of 3D animated screen saver can be downloaded immediately. Our ecommerce providers ensures that you get your full version as soon as possible, making purchase based on your own familiar currency and payment method. A small file size makes it an easy download to your computer. If you buy now you will be enjoying all the benefits of the full version within minutes! Enjoy All the Benefits of the Full Version Now! Lets you save the customized settings. 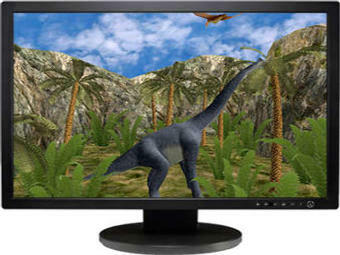 Removes any limitations of the demo version of the 3D dinosaur screen saver. Lets you get a optional backup CD-ROM (you can choose this option on order form). Provides a free technical support for software you buy. Lets you get a life time license for the version you buy without any annual payments.